I certainly believed that for a mediocre book, the premise was excellent, unique and interesting. Strangely, I read this right after completing Albert Camus's The Stranger and it put me in the mindset to think unpractically. Both the 'boy' and the 'stranger' in the two books are unreliable narrators and the insights into their thoughts still didn't bring them individuality. I felt that the writing style didn't permit the understandings of the characters' minds which degraded from the whole plot and the storyline even suffered. 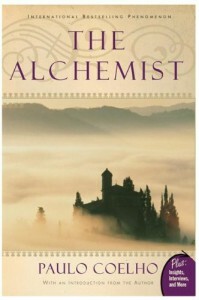 While still having a grasp on my own ideals, the concept of alchemy and destiny was great to ponder on. Among other philosophical books, this one stands out the most for being spiritually imbued with unreasonable faith, power, and destiny. Of course, everything was overly unrealistic but it was interesting to read the huge twist at the end which had me grinning like a madwoman. I think it was worth it but I felt near the end that the tale had been long-winded and could've been easily shortened.